“Your Majesty?” Someone shook Bartholomew’s arm gently, their touch so light he thought he dreamed it. He grumbled, trying to burrow deeper under the covers. He knew that it was still night, the darkness wrapped around him tighter than any blanket. There was no crisis, no issue that required his attention before dawn. He could slip away from the kingdom, from the ghosts, from all, in sweet oblivion. The world could be so stubborn at times, refusing to leave him in peace. With a ponderous groan, Bartholomew pulled himself out from under the blankets and sat up. The serving boy stood before him. Death and destruction, what was his name? It little mattered, he supposed. The boy stood there with a goblet of wine, which pressed into Bartholomew’s hand. “What is it?” Batholomew asked. The boy stammered a non-answer, something about the royal guards sending him. Bartholomew sighed and took a sip of the wine. He winced at its acidic bite. Perhaps not the right thing for him to drink in the middle of the night, but what else could he do? He had to wash the taste of sleep from his mouth, especially if he was to deal with these “people,” whoever they were. He held out his hand and the boy jumped back a full three feet, but then scurried forward to help Bartholomew stand. He shuffled over to the wardrobe and sorted through his clothing. What should he wear? Without knowing who was waiting for him, he had no idea how to dress. Obviously he couldn’t show up in his nightclothes. Or maybe he should. Wasn’t he king? These mysterious people, they were interrupting his sleep. Maybe if they saw him in this state, they would learn a valuable lesson. No, that wouldn’t do. Yes, it might be satisfying, but he would only lose face in the eyes of the court. 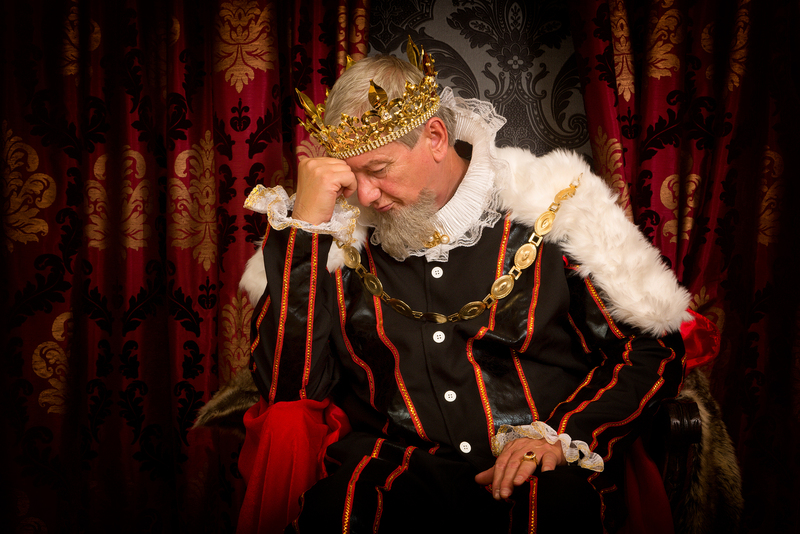 If the king were to show up in the throne room in his nightclothes, tongues would wag and his political strength would fade. Oh, it already was, but he didn’t need to encourage that. He selected a thick velvet robe and shrugged it on, tying the belt around his waist. True, he wouldn’t look nearly so formal, but at this hour, it would have to do. He took another sip from the goblet and choked down the bitter wine. Given the depths of the palace’s wine cellar, there should have been a much better vintage. Perhaps the boy had to be educated on proper wine selection. Bartholomew gave the servant a sidelong glance. He hovered near the entrance, casting anxious looks toward the door. Bartholomew sighed. Far be it from him to keep the young fool from whatever he had planned. The boy nodded and led him through the darkened corridors. As they left his chambers, guards fell into step on either side of them. Bartholomew ground his teeth together as they walked. He would have to have a long talk with…blast it, what was the name of the commander again? Whoever it was, Bartholomew would have to remind them that part of their duty was to protect him from petty annoyances, especially while he slept. Within a few minutes, they had descended from his room in the Tall Tower and entered the throne room. Bartholomew blinked, surprised at the number of people who were packed inside. Had the court assembled without his invitation? Would they be so brazen as that? No, wait, no one was dressed appropriately. Instead, they wore cloaks and clothing more suitable for travel. There had to be a dozen people, all of them looking tired and worn out. They didn’t appear to be natives of Darkshire Woods. The booming voice cut through the sleepy haze that still wrapped around Bartholomew’s mind. He recognized it, but from where? One of the travelers stepped forward, a thick-chested man with a long, brown beard that had been gathered into four braids, the longest of which hung down to his stomach. A thick scar ran across his forehead and down one cheek. A thin iron band partially hid the scar. “Maxillian!” Bartholomew tottered forward, opening his arms. The King of Seviel strode forward and wrapped his thick arms around Bartholomew. He didn’t squeeze to tightly, as he might have years ago. “What are you doing here, my friend?” Bartholomew asked. Had he? That sounded right. It certainly would make sense to invite other royals to attend the adoption and subsequent feast. Had any others shown up? Bartholomew couldn’t remember any. Was that because he hadn’t invited any others or because they had snubbed him? Botheration, why couldn’t he remember? Bartholomew grunted, a noncommittal noise. Bartholomew nodded absently and shambled to his throne and sank into it. His arms felt heavier, somehow, as if his troubled memory were dragging on them, trying to pull him into the floor so he would drown within the stone. That was a good point. The chamberlain should have been the one who greeted Maxillian and his party. Bartholomew signaled for one of the guards to approach. The guard snapped into a salute, grim determination on his face. He then turned on his heel and marched out of the room. Bartholomew had hoped his tone hadn’t been too severe, but perhaps he had let too much of his frustration bleed through. No matter. Gerard had shirked his duties, no doubt. It would perhaps be helpful for the chamberlain to believe he was in trouble, at least for a little while. Maxillian fidgeted with the edge of his cloak, glancing at the rest of his traveling companions. None of them would meet his gaze. Then Maxillian launched into the tale of their fighting the pirates. Bartholomew tuned him out. Maxillian was a good king, he knew this full well, but he couldn’t stand silence. Whenever they were together, Maxillian would do his best to fill any empty silences with inane stories or meaningless comments. It kept him relaxed. After a long journey, he likely was feeling tense and it didn’t cost Bartholomew anything to let the man prattle. And it would help pass the time while the guard fetched Gerard. Thankfully, Maxillian hadn’t finished his tale by the time the guard returned, only he reentered the throne room alone. The door at the back of the room groaned open and Edrys breezed into the room. She wore a gossamer robe over a more practical nightgown. Her face lit up when she looked at him, but then her expression froze in place. “G-good evening, Father.” She slipped through the Seviel delegation and dropped down at his feet, a beatific smile on her face. Edrys dipped into a low curtsy, her head tipped to the left. She kept her gaze low, apparently locked on Maxillian’s knees. Was that a tremble that wormed through her body? His daughter looked so small in front of the foreign king. He felt a sudden urge to step between them, to shield the girl from his friend. But why? “Your Illustrious Immanence,” Edrys murmured. Bartholomew’s eyes narrowed. There was something wrong with the way he said that last word. Perhaps he should ask why he had that tone or why his daughter looked so frightened. The feeling drained out of Bartholomew’s body as the guard continued: Gerard’s body, found dumped outside a brothel in town. He could practically feel the shock boiling off the delegation from Seviel, especially from Maxillian. But not Edrys. No, her eyes were still locked on Maxillian and they shone with something that looked very much like fear.